Go for Two! Our new JD Epifanes Clear Gloss Kit (CVKIT) includes two 1000ml cans of varnish, 2 foam brushes, 2 paint strainers, 2 stir sticks, and 2 plastic paint pails. This is a great value. You save on the varnish and receive brushes, strainers, and pails for free! Container Size: 250 ml., 500 ml.,1000 ml., 5000 ml. Temperatures should be between 50 degrees F and 85 degrees F for application, with air humidity below 85 percent. Avoid varnishing in too much sun or wind, a rapid loss of solvents will occur under these conditions and will decrease the flowing ability. 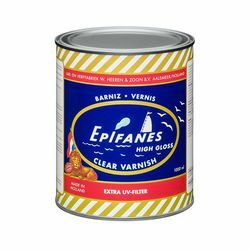 Epifanes Clear Gloss Varnish is compatible with most other types of one-component alkyd or urethane based varnishes and over two-component varnishes. Be sure to read all safety information on the label and in the SDS (safety data sheet) before using this product. Keep out of reach of children. Keep away from heat, sparks, open flames, and hot surfaces. No smoking. Do not breathe dust, fumes, gas, mist, vapors, or spray. Use only outdoors or in a well-ventilated area. Wear protective gloves, protective clothing, eye protection, face protection, and a proper respirator. Does high-gloss Epifanes spar varnish yellow over time? No. I use the varnish outdoors on my home's wood trim. Two or three coats lasts 2-3 years before it cracks and needs repair. The sun light does not cause any discoloration. I love the shiny appearance over mahogany stain on molding and fir (?) fascia boards as well as treated pine deck rails. Maybe a few more coats would last longer. I also use it indoors in a stone shower over stained thin strips of wood trim. The varnish needs "updating" after about a 12-18 months of daily soap/water/cleaner abuse. And I use it on indoor stained wood trim around windows, floor boards, etc. - this has lasted for many years (10?) without any touchups. I highly recommend Epifanes! Sorry, no marine experience. Epifanes recommends 50% first coat, 25% next, then 15% third and after that 0 to 5%. There is no specific percentage of thinner for each coat. It is more based on the material you are applying it to as to how absorbent it is. I would start out with 20% and see how the material flows. What you want spread without runs. The thinner will allow you to spread it out thinner. We use two units of Epifanes to two units of thinner and one of boiledlinseed oil. We are using it on out door furniture as recommended by theNYTimes many years ago. I have a totally sanded exterior wood door. Do I have to lightly sand between each coat if dry, or can I apply 3 to 4 coats in a 24 hour period without sanding (preferred)? This product can not be over coated at this rate. The first coat should be thinned as directed, and then the product really needs to cure and be sanded between coats. This resin system is not designed for quick overcoating. I believe you can do what you describe. I heard that from a professional varnisher at the Port Townsend wooden boat festival. Is this an appropriate product for a rudder and daggerboard of a sailboat? If it is, would I use it alone on the sanded wood? This product would be fine for a daggerboard and rudder, but after use you would want to pull both of these components off. Being proactive by fixing any scratches or damaged areas that come up sooner than later will help preserve them better, and maintain better service life of the varnish. Apply the product as directed to bare sanded wood, and you will want to thin it with the appropriate thinner for the best application. What method do you recommend to prevent stored varnish from "gelling" due to oxidation? I have tried decanting to smaller containers to reduce the amount of air, but wonder if pouring it off just increases contact with the oxygen in the air. The varnish still turns to jello top to bottom after a few weeks. For partially full cans, I have had some luck with introducing propane from a canister into the can before quickly putting on the lid. Decanting into smaller containers will help reduce the oxygen, and the less are in the can, the longer it will last before skinning. We also sell Bloxygen, which is argon in a spray can, that is meant to displace the air in the can, and prevent oxidation--it's odd because it feels so light that you would think the whole can would float in air. Some people have had great luck with that. Personally, I have bought varnish in small units. Instead of buying a CV1000, get 2 x CV500 cans. It's more expensive for sure, but less waste, and smaller containers to manage, not to mention you aren't spending any other $ on methods to preserve it. I simply turn can over after opening. Keeps gelling from happening for awhile. Can this product be applied to outdoor furniture with commercial airless sprayer. I can only say that I have used an HVLP sprayer with good results. Follow the thinning instructions on the can and try it on a test piece. The worst that can happen is you wasted some varnish and some clean up time. The experience will be more valuable than the time you spend wondering if it will work. I am not sure why it would not work. Thin with TPVB500 or TPVB1000 (500 ml or 1000 ml). Can you use a roller and still have a smooth finish. If so what size nap? Yes, you can use a foam roller, and tip it with a brush to smooth out any bubbles. I'm restoring a 1930 home with a large covered front porch. I have stripped the floor (tongue and groove pine) It will be professionally sanded. Can this product be used? If so what application method would be best for a large flat surface? Can it be rolled or applied with a similar pad used for interior floor finishing? You can use this on the floor. It is a little on the thick side and is best thinned a little with their Epifanes brush thinner and it can be rolled. Can pigment be added to darken the product? I'm using this on house shutters and would lid to darken the finish. You could stain the wood first. Not sure if you could add a little stain in the varnish or not. I'd try a small amount first. Can Epiphanes traditional varnish be final coat wet sanded and compounded for a show finish on a woodie wagon? What would be the suggested process, (grits of paper and compound)? How long should the finish cure before attempting to do this work? Yes, it can be wet sanded and buffed. I would wait at least 2 weeks or longer to insure full cure. Start with 600 wet dry and go up to 2000, or start with a higher grit if you don't have a lot to remove, then buff with a finishing compound like Total Shine. I applied the Epifanes Gloss Clear Varnish to a porch aka yard swing I made in 2014 which has several coats of varnish applied over the years. I scraped areas that had cracked badly due to the elements and applied one coat of the Epifanes Clear Varnish using a foam brush.The swing is back in the yard ready for service again. Re-doing teak tables for hotel. The project was to strip and refinish teak slat top tables and chair arms for a local hotel's patioarea and pool courtyard.After sanding, I applied Zar oil based stain (teak) to the surfaces I could get at. Then, using a turbine HVLP, I applied the varnish. I thinned it with Naptha (sp?) about 30 to 40 %.I was astounded at the quality of the finish. Smooth as silk. 3 coats. I used it for an interior application on cherry wood. Then I top coated it with the Epifanes rubbed effect varnish which was much more difficult to use. In the past, I have used Interlux matte varnish with excellent results. Cant find a better price for this anywhere. Hands down a great varnish. Used the clear, gloss varnish on two garage doors. The varnish was easy to apply and left the doors looking like mirrors. Though the doors are exposed to direct rain and sun, I feel certain the excellent varnish coverage will protect the doors for an indeterminable time. Also, applied the varnish to a mahogany entry door with the same satisfactory results. Again, first time using this product. Note this does have a slight tint. Went on well. Looks good. Used on wood strip, glass coated solo kayak. Three coats provided an outstanding smooth finish. Don't know why but this took an awful long time to dry. It stayed tacky for weeks.It does look good. Easy to work with, looks great and gives a brilliant shine that protects and lasts a long time.